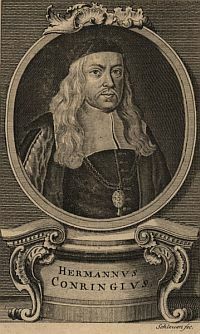 Historian, jurist, physician and philosopher, professor at the University of Helmstedt, of which he also became Rector. Promoter of the creation of the Wolfenbüttel Library. Valued political counsellor, he supported the autonomy of the law from theological considerations, the importance of historical statistics and in the natural sciences he popularized Harvey’s theory of circulation. Main works: De origine iuris Germanici (Helmstedt 1643); De finibus imperii Germanici (Helmstedt 1654); Animadversiones politicae in Nicolai Machiavelli librum de principe (Helmstedt 1661); De sanguinis generatione e motu naturali (Helmstedt 1643). Bibliography: A. Jori, Hermann Conring (1606-1681). Der Begründer der deutschen Rechtsgeschichte, Tübingen, MVK 2006; D.F. Lindenfeld, The Practical Imagination. The German Sciences of State in the Nineteenth Century, Chicago, University of Chicago Press 1997. Catalogus bibliothecae Conringianae, variis in omni genere doctrinae eximiisque libris refertae, quae ... ad 3. Jul. & sqq. hujus anni lege auctionis consueta distrahetur in aedibus Conringianis, Helmestadii, Hamm 1694. The volumes are subdivided according to format: In Folio (nos. 1-427), In Quarto (nos. 1-849), In Octavo (nos. 1-1050), Formae minoris (nos. 1-459), Appendix Librorum partim omissorum, partim incompactorum (nos. 1-196), Appendix In Octavo (nos. 1-57), Appendix In Duocedimo (nos. 1-22), Conringiana (nos. 1-27), Appendix Librorum variorum campactorum In Folio (nos. 1-55), In Quarto (nos. 1-52), In Octavo (nos. 1-62), In Duodecimo (nos. 1-17).